Team Yanny or Team Laurel – Which One Are You? Another internet “what color is the dress” type craze has emerged. A sound clip that simply says one word is causing major debates. The student played the sound clip that is typically provided on such websites and was shocked. He was looking at “laurel,” but he was hearing “yanny.” He took the discussion to classmates, which sparked the first of debates. Then he took it to Reddit. So, why does this happen? Why do people see different colors (i.e., “the dress) and hear different sounds? 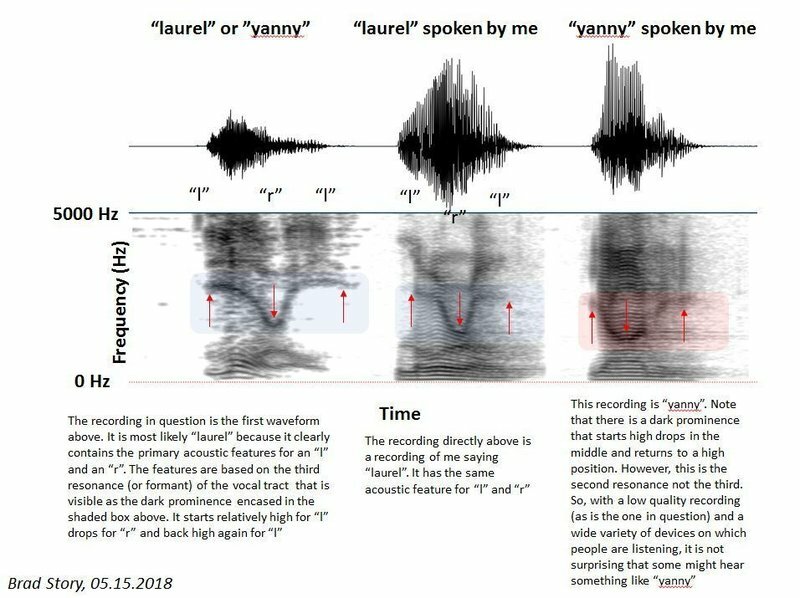 NPR spoke to Brad Story, a professor of speech, language and hearing sciences at the University of Arizona who said he noticed similar features in these words frequencies (above). Both words share a U-shaped pattern although they correspond to different sets of frequencies that the vocal tract produces. In the interview he said, “So with a recording that’s somewhat ambiguous and low-quality, it’s not surprising that some people may flip those when they’re perceiving that word.” Interesting! Don’t believe it? The New York Times created an interactive tool that allows you to shift frequencies are you’re listening to the word. Are you wondering which I heard? I definitely heard laurel. In the office, only one of us heard yanny. What did you hear? Previous Post Phil Mickelson’s Shirt – Product Placement in Vogue or Unfashionable? Next Post Have You Seen the Shirt?